Just imagine this scenario. You're the proud owner of a family shop. You sell the latest training shoes at a price that is attractive to your customers, but also lets you make some profit. For years you’re doing just fine, then, one day, someone opens a shop next door and sells the same trainers at half the price. You try to compete by lowering your prices but now you can't make any profit and your customers have gone. After a few months you’re forced to close up shop, and lay off your staff. The shop next door that sold trainers at half the price did so because they were counterfeit – not the real thing – a copy. The genuine trainers you sold had been made to a high standard - quality checked with thousands of hours of research. The counterfeit trainers were made as cheaply as possible. Maybe by under aged workers working in poor conditions, using methods and chemicals not fit for human feet. They were then imported into the UK without paying any taxes. So, of course, they could be sold cheaper. Whilst this person's customers think they're getting a great deal, what they don’t know is their money is directly funding another project – manufacturing counterfeit alcohol. The money paid for the training shoes was enough to pay for 100,000 counterfeit bottles. The alcohol was pretty cheap anyway - it was going to be used as screen wash for motorcars. So, the dangerous fake alcohol unfit for human consumption, is now stocked in the corner shop. Just opposite the shop selling counterfeit training shoes. Some bottles are sold, and some people become very ill.
One person loses their eyesight. Trading Standards are notified and they seize the fake alcohol. Unfortunately, the people who sold it to the corner shop were never identified. Because they were part of a well-organised criminal group whose only intention was to make as much money as possible. This story is based on real examples that enforcement agencies deal with every day. It's probably happening across the UK right now. The money from a fake pair of training shoes helped fund an organised crime group import fake alcohol. This resulted in someone’s life being changed indefinitely. It has many different variations. It could be hair straighteners funding terrorism, or car parts funding drug dealing. I chair the UK’s only group for organisations that tackle IP crime – the IP Crime Group. Every 2 months, organisations such as Trading Standards, the Police and government agencies meet to discuss the work we do. We share best practice and try to find opportunities to work together. As a group, we also produce an annual report. The Minister for Intellectual Property, Baroness Neville-Rolfe, launched our latest report last Friday (10 October 2014). I’m grateful for the support of the team at the Intellectual Property Office. They have spent so much time helping me coordinate the IP Crime Group and helped produce this report. When you’re next presented with an opportunity to buy something you suspect is fake, please stop and think. Do you want your cash to fund organised crime? 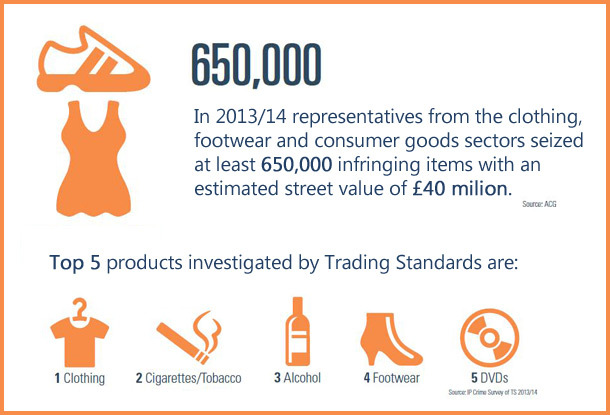 If you've bought something without realising it wasn't genuine – report it. You can report these crimes to Trading Standards, Crimestoppers, the Police and Action Fraud. If we don’t know about it – we can’t do anything.